Living rooms are crucial to every house; more often than not, they are reliable for making the first impression and we all love to make an interesting first impression, right? So what do you do when everyone else is busy doing the same old, banal living room decor? 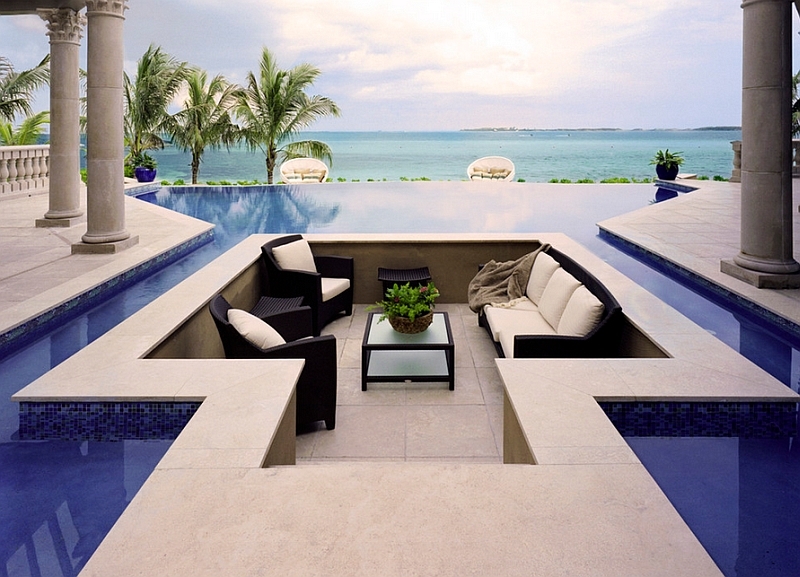 Two words: sunken seating. 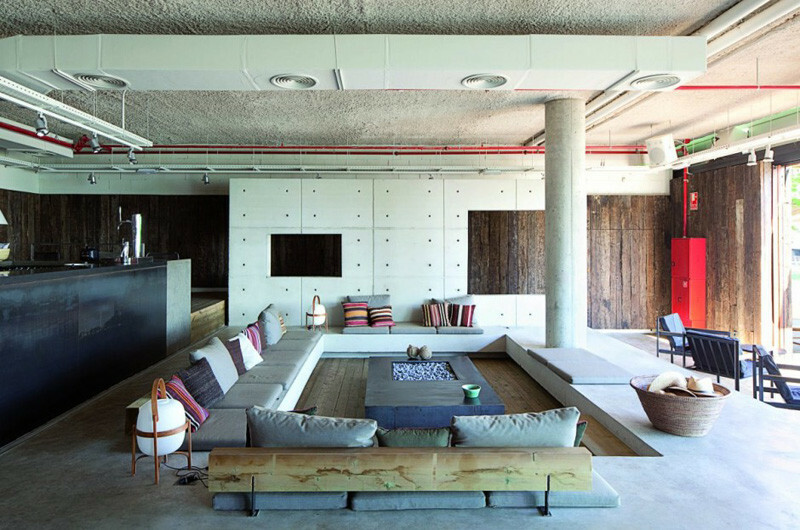 Sunken seating is an exciting way to add a fun element to your living room decor and make it stand away from the crowd. The idea became all the rage ever since it was showcased in Mad Men and from then, people started realising that its roots go way back to the past and has been providing comfort with a fun twist for a long time now. A large number of interior designers have praised sunken seating for the apparent sense of openness it provides and the room/space it affords to the entire room that it is in, which makes the house appear not only more spacious but also, elegantly designed. 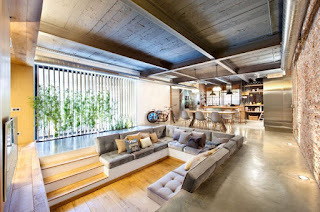 So given below are eight interiors that have perfectly understood the concept of sunken seating and have swept us over with their elegant furnishing. Let’s take a look, shall we? Well, isn’t this room a delight to the eyes? As is evident from the photograph, the sunken seating is on a lower level than the kitchen and the dining area, which affords a certain sense of affability to it. The sunken seating gives you the luxury of not having to install a barrier or some sort of distinct structure between the living room and the kitchen, and rather, juxtaposes the two together in a fashionable manner. Imagine having guests over at your place, having them seated in this living room while you can notice the kitchen as well. It sure does sound interesting. 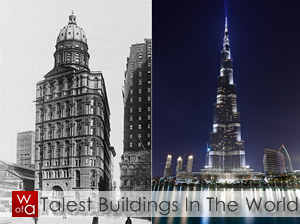 Now this is a completely unconventional, unprecedented idea and we are in awe of it. Everybody loves to have a seating arrangement by the pool and let’s face it, we love spending an evening beside an indoor pool. This particular design incorporates that endearing emotion and mixes it up by installing sunken seating beside the pool, which as you may have noticed, is not only beside the pool, but in a way, it is within the pool. Now isn’t that interesting?! The soft tone of the interior matches well with the equally soft tone of the seating. The pool beside the seating and the verandah that is just a few steps away from the seating area (if you notice a bit more closely, then you will see the verandah is just after the room after this), add even more elegance to the entire interior. This is a classic example of what we have been talking of for quite some time now. 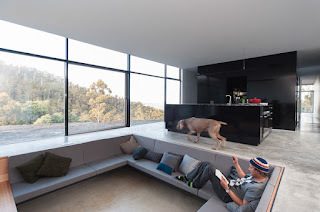 Notice in the photograph that the sunken seating does indeed provide a certain sense of openness to the entire house, and without the need to install a distinct structure between the living room and the kitchen; the area becomes much more spacious and even more appealing. If you furnish the room with quirky yet voguish items like a piece of modern art or sculpture, or like the bicycle in the photograph, the room will be adorned with much more pleasantness than it already has. Imagine having this room with the entire paraphernalia as is shown in the photograph. Wouldn’t that be amazing? A room with sunken seating, an apparent sense of spaciousness and a few pouffes or ottomans for furnishing it; now that is a room anyone would prefer to have for a nice, lazy evening. Wouldn’t you as well? As is quite visible in the photograph, the sunken seating has quite readily provided the room with elegance and pleasantness; they are modernised and blend in well with the modernised interior of the room, that is to say, the modern painting, the beautiful glass doors and the elegant channel for TV. 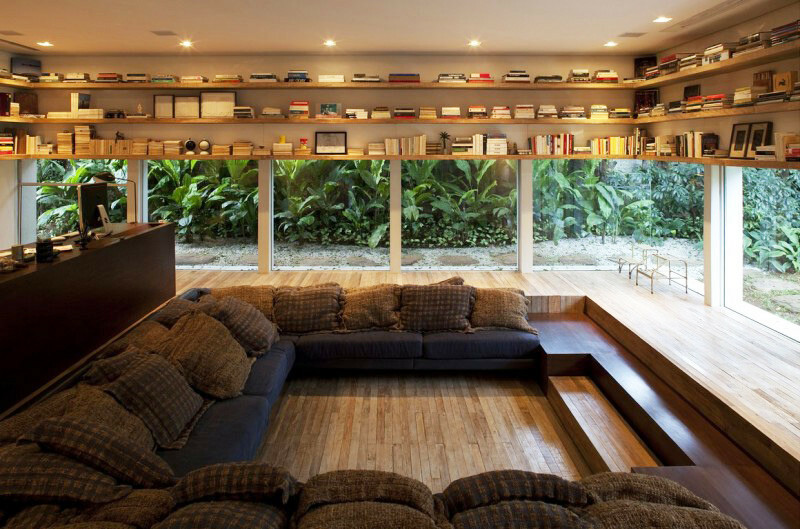 The room is a classic example of a modernised idea of sunken seating. Way to go, Texas! The room is amazing to its very core. The rustic feeling sunken seating provides it with, the beautiful overhead book shelves, the glass doors, and windows, with the thick foliage around the place and the wooden flooring; all these elements come in together to present a room that is a true example of fine seating. If we analyse the room a bit more, we can comprehend that if we were to take away the sunken seating from the room, then the outlook might have been a lot different than what it is right now. That is to say, without the sunken seating the room will appear claustrophobic and ill-furnished. You can imagine it, right? See what we meant when we said that this seating is really efficient? We love this idea, and there is no other way for us to describe it apart from praising it. The sunken seating lends an amicable ambience to the room because of not only the openness that it provides (we have heard that a lot now, haven’t we? ), but also because it reduces the too much of the emphasis that is laid on living room items. The sunken seating, in this case, has actually provided the room with a sort of simplicity that makes the room appear beautiful through minimalist quotients. If you notice a bit more clearly, in the photograph, the sunken seating has increased the amount of space that is there in the entire room, the couch that is installed as the furniture for it, is basic and elegant; and is comforting because of the sea-facing side of the seating. The decoration’s simple and rudimentary, and we feel that is the reason why the room appears so voguish. Ah Italy, the place where you are never disappointed in terms of fashion and architecture. And the place is famous for the suaveness with which it employs new ideas and methods into its decor. Our arguments are quite easily apparent in the photograph, wherein you can notice that the sunken seating has yet again proved to be efficient and elegant; and extremely versatile. The sunken seating in this case has blended in easily with the soft shade of the interior decor and we notice something different here; the seating now along the wall rather than in the centre of the room. And let’s just say we love this idea. By doing so, the decorator has actually made more space for the room to possess, the pathway has increased and the seating has proved to be efficient even for the houses that are not too big in size. 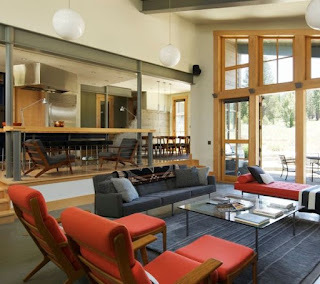 Till now we have seen houses with a large living room, but in this case, the size is relatively smaller (operative word being relatively), and the walled sunken seating concords perfectly well with the size of the room. Nicely played, Italy. We are back to the basics with this design but once again, there is a twist at the end of our tale. How, you ask? Well look at the photograph, folks. Sure, the place has the basic amenities of a sunken seating: openness, no need for a distinctive barrier and lots and lots of space. But there is one new and different element to it. Found it yet? Let’s break it down. It’s the design of the sunken seating. Until now we have been talking about the ways in which sunken seating fortifies your decor, but this interior from Barcelona takes it up a notch, by using a design that is quirky as the seating itself. The entire room has a futuristic vision because of the minimalist design, the uber-modernised fashion in which they are placed, and the sci-fi-like wall. If anything, the place looks like a shot taken from a movie’s set! So there you go, people. Eight different interiors which have beautifully incorporated the idea of sunken seating and have depicted to us why the world has never gotten old of this design. Over time, sunken seating has changed but it never got lost. And now we know why.